This option creates a new project and opens it as the current project. 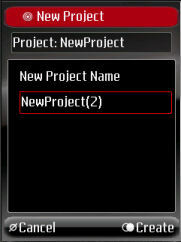 A default project name is generated in the project name text field, this can be changed. Selecting cancel returns to the Project Options without creating the new project. Selecting Create creates the new project and opens it, hence the newly created project becomes the currently open project.